a guest article by Katarina Eglin from the German Federal association “Das frühgeborene Kind” e.V. 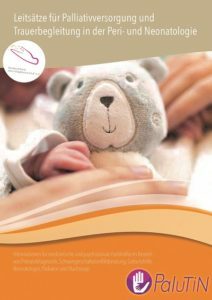 Terminal care and grief counselling always act as part at neonatal care facilities when children are either born very preterm or seriously ill. However, so far there wasn’t a suitable recommendation for action in the German speaking countries, which provides guidance for the healthcare team to deal professionally and competently with this burdening and challenging topic. On this matter, experts as well as affected parents joined forces on behalf of the German Federal association “Das frühgeborene Kind” e.V. on an interdisciplinary level, to contribute their individual expertise for the development of a relevant recommended course of action. The task force PaluTiN (Palliative care and grief counselling in peri- and neonatology) was formed. During the past two years, the task force has developed ten guiding principles that also cover the antenatal period as well as the time after the baby has passed away. These guidelines were presented on this year’s annual meeting of the German neonatal society “Gesellschaft für Neonatologie und pädiatrische Intensivmedizin” (GNPI) in Rostock, Germany. Sometimes, the suspicion or diagnose of a life-shortening disease is made during pregnancy. Therefore, the principles aim at healthcare professionals and psychologic counsellors to give them practical support in assisting already expecting parents in these challenging situations. 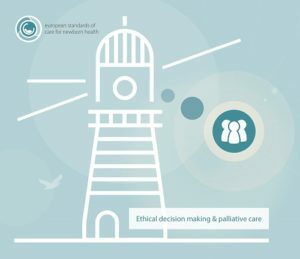 Based upon clinical studies as well as scientific literature, they provide valuable guidance taking contemporary and, if possible, all relevant aspects for palliative care and grief counselling into account, regarding the perinatal and neonatal phase. The recommendations refer to similar situations and cases and deliberately provide options to act individually, because the needs of affected parents can strongly vary in such extraordinary circumstances. It is appropriate to come to know those needs with empathy and applying an appropriate procedure in every individual case. The principles can play a supporting role in gaining confidence, professionalism, and empathy while interacting with a dying child and its closest relatives, who find themselves in an extremely vulnerable situation. Due to their emotional exceptional situation, affected families require an empathic and competent guidance. The project was kindly funded within the realm of self-help facilitation by the health insurance company “KKH Kaufmännische Krankenkasse”. As from August 2018, the printed principles are available for free as a brochure in German through the online shop of the federal association “Das frühgeborene Kind e.V.” at: shop.fruehgeborene.de . The PDF version of the brochure is available for free download. An English translation is planned. German Federal association “Das frühgeborene Kind” e.V.